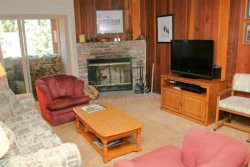 2/32: Mammoth Condo Rental Snowflower 11 - LR has a Fireplace, Large Flat Screen TV and Outside Deck Access. Firewood is not provided. Guest will need to purchase their own firewood. Nice Unit, 2 Bedroom, & Loft & 3 Bath Town home located in the Scenic Meadow area of Mammoth Lakes. Sleeps up to 8 (approx. 1300 Sq. Ft.) . You enter the unit on the first floor which has both bedrooms and 2 full bathrooms. The second floor is the living room, kitchen, dining room and 1 full bath.The unit has a wood burning stove but firewood will not be provided. The third floor is the loft (open in to the living room by a half wall). Each bedroom has 1 queen bed, the loft has 2 twin beds and 1 trundle bed (i.e. 2 twins). There is 1 Queen Sofa Sleeper in the Living Room. 4 TVs (Large flat screen in the LR and 1 flat screen in first bedroom), 3 VCRs, 3 DVDs, stereo/CD player. Wireless internet in unit. Phone in unit 760-934-1477 . This comfortable unit is tastefully decorated with mountain style decor. There are a maximum of two outdoor parking spaces available. Snowflower Features a Hot Spa and Sauna, Summer Time Only Swimming Pool, and Tennis Court. Coin-operated laundry facilities located in the common area near the office. There are no Buses, Motorhomes, Trailers or any type of Towed Vehicles allowed on the Snowflower property. COMPLIMENTARY INTERNET and CABLE TV are provided, however NO REFUNDS will be given for connectivity problems or Internet failure. TOT LICENSE 807-SF11. The place was great! It had everything we needed and it was close to everything. We had a great time, thank you! Great Location, walking distance to the stores! It was clean and spacious. We appreciated their quick-response time. I contacted the office for two folding chairs and we got them in 15 mins. Perfect cabin for our family, we truly enjoyed our stay! Our stay here was incredible. The space is amazing and is conveniently located right next to the bus stop. It feels very homey and there is plenty of room for a bigger group. The host was also very responsive when contacted. Overall I would highly recommend this home and would definitely come back in the future! We definitely enjoyed our stay! Everything was absolutely wonderful. Much bigger than it looks in the pics - awesome location and super easy! Thanks a lot! Location and price were great. It was clean, very spacious and was totally worth the money. Nice cabin, walking distance to the village! The first floor has two rooms with bathrooms and queen beds, and there is a huge living room-kitchen on the second floor with another bathroom. The third flood is communicated with the leaving room, and four people can sleep comfortably there. Overall, we had a great stay at the house. It is very cozy and warm for the winter! Great place to stay, not over priced and well worth what you get. If youre here to enjoy a few days on the slopes, this is the place for you. Overall, amazing stay! Everything was great, wouldnt change a thing. Best part was the space of the cabin provided, as well as everything we needed (wifi, beds to sleep on, good furniture etc). This is a perfect place to stay if you are on a ski trip. Very close to eagle lodge and there is actually bus outside to take you to the ski resort or around the town. I enjoyed my stay, the instructions are pretty helpful and I enjoyed all the chamonix posters. Thank you, my family enjoyed a great week in Mammoth and we will be back! Thank you fo the nice stay. We will difinitately use your service in the future.